OurAccreditation.com is a Solution from FMS, Inc. Since we started in 1986, FMS has assisted countless individuals and organizations make better data driven decisions. As database experts, we help our clients improve accuracy, efficiency, and costs. We give managers better control of their processes, provide data to key decision makers, and help developers add features and gain insight into their applications. Collecting, analyzing, and presenting data in ways that empower individuals is what we’re all about. To address a pressing need within the accreditation industry, we have developed a world-class, highly flexible, easy to use, web enabled system to assist organizations who manage their organization’s accreditation process as well as organizations who are seeking accreditation from a national or regional body. OurAccreditation system can be customized to accommodate not only the unique aspects of your accreditation standards and requirements, but puts you in control to determine the level of system support and access that best suits your organization now and in the future. 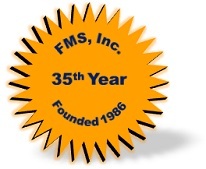 Founded in 1986, FMS is a privately held software firm located in Tysons Corner, Virginia. FMS is a Microsoft Certified Partner and a member of the SD Times 100 (the top 100 most innovative software firms). Committed to innovation and quality, all FMS solutions are developed by our in-house team of experts including several Microsoft MVPs, published authors, and frequent speakers at conferences around the world. FMS is the world’s leading developer of products for Microsoft Access, with additional products for the SQL Server, Visual Studio .NET, and Visual Basic communities. With tens of thousands of customers in over 100 countries, FMS customers include a variety of organizations from small to large including 90 of the Fortune 100 and every US federal government department. Our experience and processes for developing commercial off-the-shelf software deployed worldwide is applied throughout all our development efforts. In addition to our popular products, FMS also offers custom software development services. It takes a great deal of expertise to create products that run on so many machines around the world. Leverage our development experience to enhance your existing applications or create new solutions to take your organization to the next level. Discover why so many organizations choose FMS as their go-to partner and preferred vendor for Microsoft solutions. The FMS Advanced Systems Group is a dedicated team within FMS focused on delivering practical solutions to the complex data problems facing the intelligence community. This division is chartered to design, develop, and deploy the next generation of analytical software. Working closely with our systems integrators and intelligence community partners, ASG has successfully brought several new concepts to reality such as our Sentinel Visualizer link analysis product. Since 1986, FMS has developed innovative software solutions that transform the way organizations maximize the value of their data. Leverage our experience serving tens of thousands of customers in over 100 countries. Our track record and longevity is unique in the industry.